Casa Pilar Alpandeire - Clarinda Parques S.L. Ideal for famalies or large groups looking for accommodation in a comefortable spacious self catering house, and garden with pool. Room#3 : Three Single Beds. Salon with wood burning stove. Room#5 : One Double Bed. Swimming Pool and Garden, 2 Pations, 1 with BBQ, This property was originally a Posada (Village Inn) and still retains many of the original features such as the underground stables, tunnel access for the mules, water troughs and two internal water wells. Now reformed with all creature comeforts, fully fitted kitchen, oil-fired central heating and two wood burning stoves. There is more than ample outside space with terraces and patios, and interesting basement catacombs. Swimming pool and terraced garden. Alpandeire is the birthplace of Fray. Leopoldo. Born on 24 June 1866. On February 9th 1956, in Granada, the cherished monk died at the age of 92. His good work has attracted a number of miracles and his tomb, located in the Capuchin convent in Granada, is visited by believers in search of divine help. In fact, Granada has now officially become the city of Fray Leopoldo. 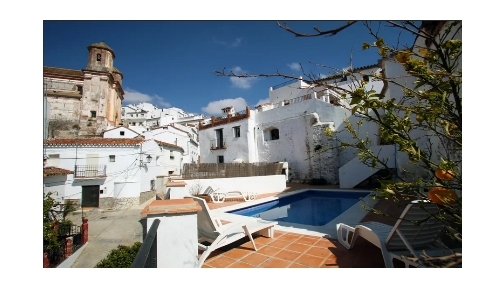 Alpandeire is less than a 14 min drive to the Historic city of Ronda, and is a great hub for visiting the Costa Del Sol, Granada, Cadiz, Sevilla. The Camino del Rey is just under an hours drive. Navigation: 1. Use the Next & Previous arrows at the sides. 2. Use the image position locater at the base to jump back and forward. 3. Or click and swipe with your cursor to swipe back and forth (or your finger on a mobile).